Dice the cucumber, lettuce leaves, tomatoes, spring onion, and parsley. Mix the salad all together. Cut the bread into small pieces (1 - 2 inches) then deep-fry or toast in a little bit of oil. To prepare the dressing, mix salt, pepper, sumac powder and olive oil. Mix this dressing with the chopped salad at the time of serving. Top it with fried pita bread and choice of extras and a lemon wedge. Salad can be topped with some roughly chopped feta cheese too. Other greens like mint leaves and rocket leaves can also be added. The dish can also be made without the sumac powder, in case it is not available. Khaboos is a local Arabic bread, which is like a chapati/roti. 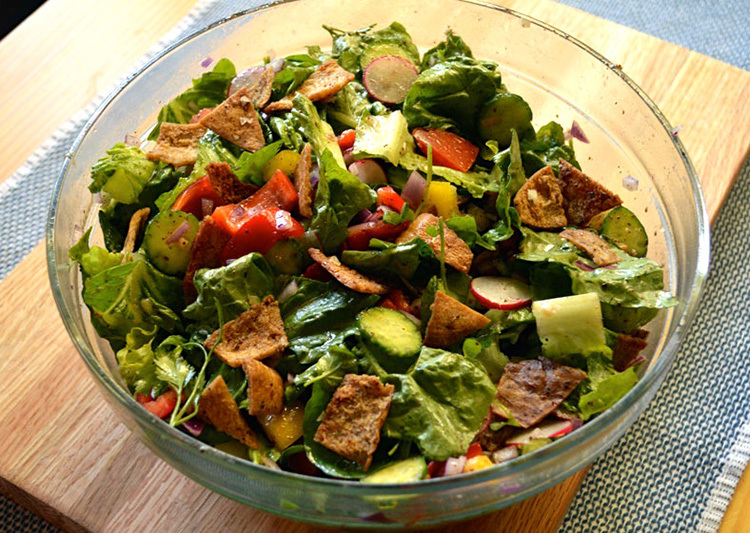 It can be replaced with any other croutons or crunchy chips.